An early morning chunk of writing so that I could drive to Indianapolis to the NCAA for a Faculty Athletics Representative (FAR) "Institute." This past January, I was appointed as Saint Francis's FAR, which basically means that I am a liaison/buffer between athletics and academics. Because this position is mandated by the NCAA, there is all kinds of *stuff* that I need to know. Hence the trip to Indy. Since I drove, I had the opportunity to burn through some podcasts. Here are my top three from the trip, in no particular order. Studio360, "Frank Langella, Rebecca Miller, & Character Alignment." The last story really caught my attention. 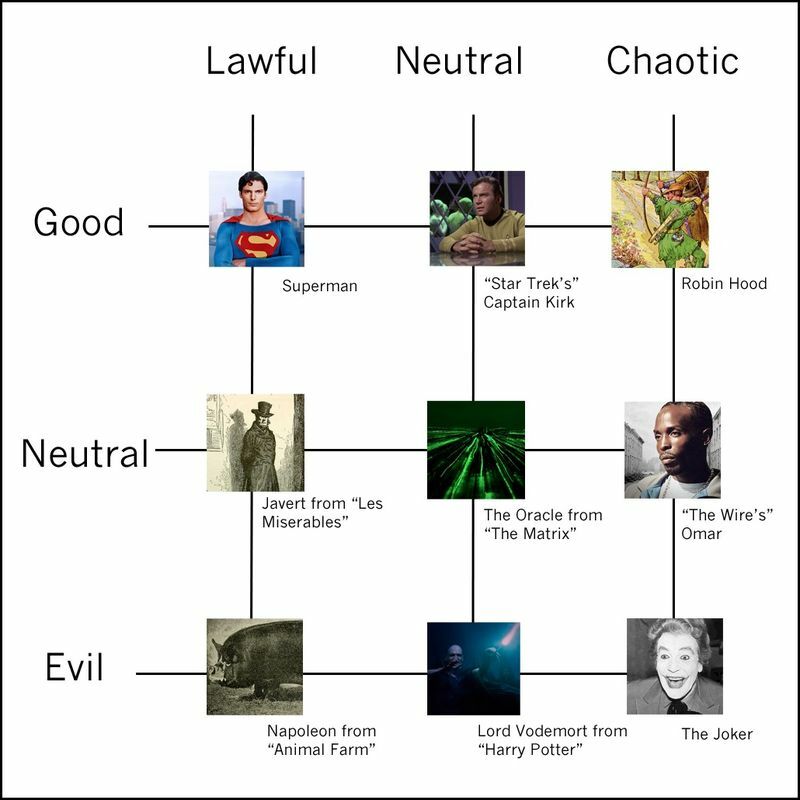 It deals with a character chart that is part of the Dungeons and Dragons world, which can also be applied to popular culture and literature. By the end of the segment, I was surprised (and delighted) to hear my friend Michael LaBossiere featured. Give it a listen. Meanwhile, one of these days, I will fill in this chart using college football coaches. "Chaotic Evil" has to be Jim Harbaugh. I mean, that's easy. But I really have to think about the rest. I have been a fan since first hearing Metamodern Sounds In Country Music. This interview just made me a bigger fan. It helps that Simpson and I are of a similar age, and had similar tastes in music growing up. At one point, he talks about how Gun n' Roses upended his music world, and quickly became a welcome island in an ocean of craptastic hair metal. He also talks some about being in the Navy, and how that has continued to shape him all these years later. Overall, I found Simpson to be genuine, humble, interesting, and insightful. All of this comes through in his music. But it was good to hear it confirmed in this conversation. I’ve been thinking a lot lately about this notion of “revolutionary love” and what that means. And it’s something that I spoke with Vincent Harding quite a bit about. And I think for me what it means to be fully human is to open ourselves to fully loving one another in an unsentimental way. I’m not talking about the romantic love, or the idealized version of love, but that the simple act of caring for one another, and being aware of our connectedness as human beings, and also the reality of our suffering, and the reality that we make a lot of mistakes, and we struggle and we fail. So plenty of good listening if you haven't tuned in already. For me, it's FAR-madness for the next couple of days. So not much time for blogging or writing. Sigh. On the bright side, I wonder if I'll see Mark Emmert? Maybe he'll want to take a selfie with me? Ah yes, I think I have my goal for the week!